Iraqi Kurdistan or Kurdistan Region is an autonomous, federally recognized region of Iraq. It borders Iran to the east, Turkey to the north, Syria to the west and the rest of Iraq to the south. Its capital is the city of Erbil, known in Kurdish as Hewlêr. The establishment of the Kurdistan Region of Iraq dates back to the March 1970 autonomy agreement between the Kurdish opposition and the Iraqi government after years of heavy fighting. After the agreement, wars between Kurdistan and Iraq had taken away much of the sovereignty the Kurds were entitled to. The Iran-Iraq war during the 1980s and the Anfal genocide campaign of the Iraqi army devastated the population and nature of Kurdistan. Following the 1991 uprising of the Kurdish people against Saddam Hussein, the Kurds were forced to flee the country to become refugees in bordering regions of Iran and Turkey. After the creation of the northern no-fly zone following the First Gulf War in 1991 to facilitate the return of Kurdish refugees, Kurdistan has been de facto independent. The 2003 invasion of Iraq by joint coalition and Kurdish forces and the subsequent political changes in post-Saddam Iraq led to the ratification of the new Iraqi constitution in 2005. The new Iraqi constitution stipulates that Iraqi Kurdistan is a federal entity recognized by Iraq and the United Nations. Kurdistan is a parliamentary democracy with a national assembly that consists of 111 seats. The current president is Massoud Barzani who was elected during the Iraqi Kurdistan 2005 elections that are held every four years. 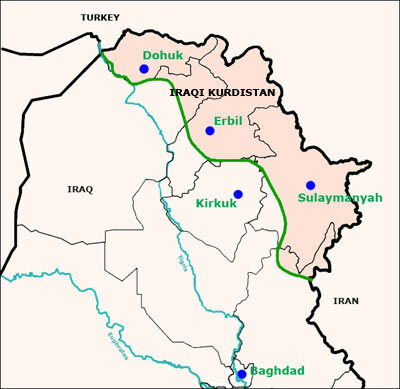 The three governorates of Duhok, Arbil and Sulaymania accumulate a territory of around 40,000 square kilometers and a population between 4 and 6.5 million. Disputes remain between the central Iraqi government and the Kurdish government about predominantly Kurdish territories outside the current borders of Iraqi Kurdistan, e.g. Kirkuk. As a major economic power in Iraq, Kurdistan has the lowest poverty rates and highest standard of living in Iraq. It is the most stable and secure region of Iraq where not a single coalition soldier or foreigner has been killed, wounded or kidnapped since the 2003 invasion of Iraq. Maintaining its own foreign relations, Kurdistan hosts a number of consulates and representation offices of countries most notably those of the United States, the United Kingdom, Germany, France, Italy and Russia. There are many sources of information on Kurdistan, increasing as the region rebuilds and continues to promote tourism and investment. YouTube – there are many videos about Iraqi Kurdistan on YouTube, with views on the current political and social situation, from a variety of viewpoints.